It was Monday night, Independence Day. Too hot to be indoors, so I hit Finsbury Park for a drink and a bite to eat. I also had it in mind to look up a group I’d heard about, a gang of guys and dames who held secret meetings on Monday nights. It had taken me a while; they kept shifting location and I had always been one step behind, but I’d finally managed to track ’em down to the apartment of a fella named Grayson. You know the type – you can tell he drinks from the bottle. These kids had a swell set up, watching a different film each time they met. 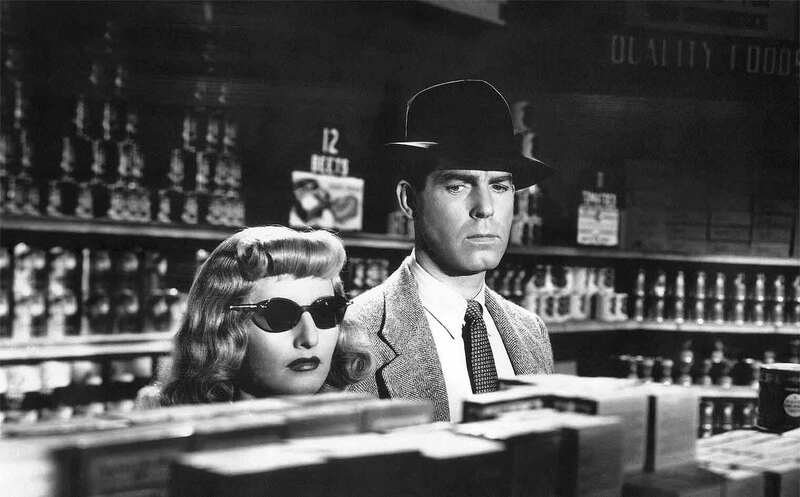 This particular Monday, it was Double Indemnity, a honey of a film noir thriller based on a novel by James M. Cain about the perfect murder and insurance fraud starring Fred McMurray and Barbara Stanwyck. The dame was a peach, but it was a shame about the phoney blonde wig they made her wear. The dialogue was sharp and fast-moving – ninety miles an hour, just the way I like it, baby. The twists and turns of the plot were clever, unexpected; you couldn’t be dumb and keep up with plot twists like that. I kept up, but then I ain’t dumb. The atmosphere of the film was dark and shadowy. I don’t claim to know nothing about film, but it seemed to me to be down to some classic film noir light ‘n’ shadow effects. There was one actor, Edward G. Robinson his name was – probably still is – playing a character by the name of Barton Keyes who particularly struck me with his wise-cracking ways and monologue on suicide. Fred McMurray’s character, Walter, was a complete heel, and I wasn’t surprised to find out that a parade of other actors turned down the part. Well, who would want to be thought of as a low-life like that? Not me, that’s for sure. Turns out, this movie was one of the earliest and most iconic examples of film noir, and I got to thinking about this genre that’s not really a genre; anti-heroes, femmes fatales, disillusionment. All pretty intense, but I couldn’t help being most impressed that that Walter fella could light a match with his thumbnail. Anyway, I think I might stick around with this gang for their next meeting. For all their talk of fascism, they’re good kids. They’re meeting again on August 1st and then again on August 22nd. No one knows where yet, but 2 guys who weren’t there that Monday could offer to host. Otherwise I guess it just comes down to volunteers. And if you ain’t going to volunteer, just shut up, baby.